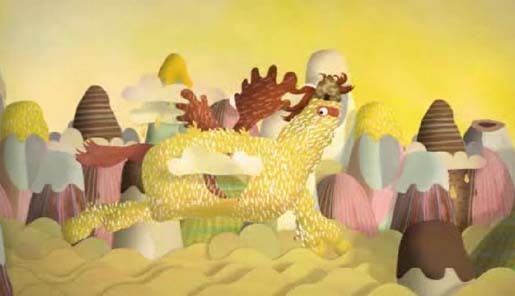 The Yellow Pages Yellow Chocolate campaign in New Zealand has been recognised with a Gold Titanium/Integrated award, a Gold Media Lion, and a Bronze Cyber Lion at Cannes International Advertising Festival 2010. The campaign began in August 2009 with a call for video entries for a mysterious quest of ambition. 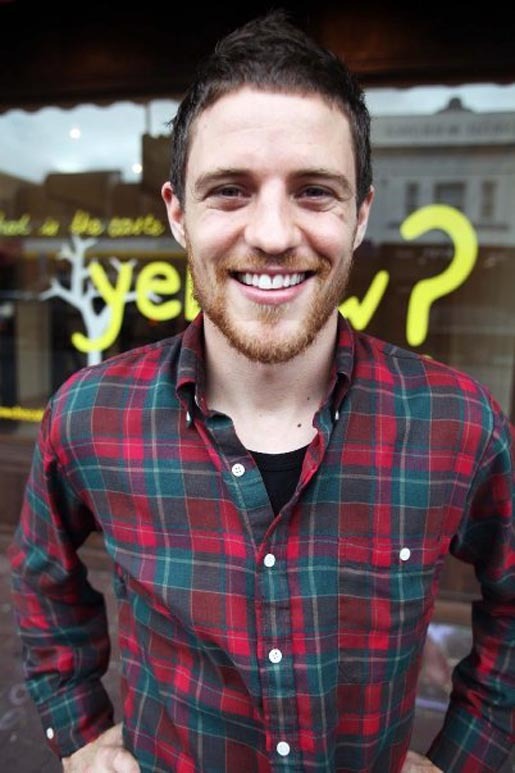 28 year old surfer and actor Josh Winger was chosen to design, market and distribute a chocolate bar that tastes like the colour yellow, and to use only companies listed in the Yellow books, both online and mobile, in the process. Winger researched New Zealand opinions on the taste of yellow by placing small cards in cafes, fruit shops and ice cream stores across New Zealand. Feedback led to the provision of four competing flavours: pineapple custard, banana French toast, kowhai honey and lemon tart. After a national tasting tour, pineapple custard won the day. Consumers voted on four alternate package designs before the product was manufactured and distributed in supermarkets. New Zealanders kept up with Josh’s progress on fortnightly TV spots and online at on the campaign at yellowchocolate.co.nz. Visitors to the site were able to watch full length webisodes, chat with Josh, make suggestions on flavours, and learn about the businesses that had helped him. Consumers could also join his Taste of Yellow fan page on Facebook, sign up for tweets at Twitter and visit the auditions on YellowNZ YouTube channel. Josh’s tweets were transmitted to specially modified billboards. 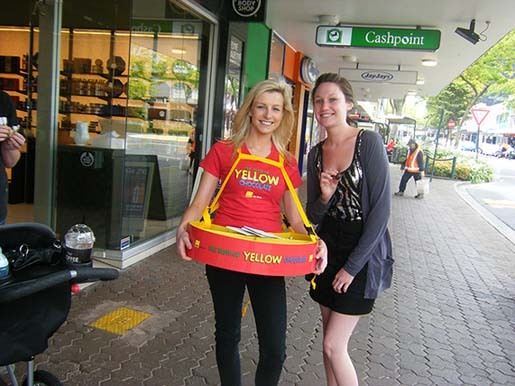 The Yellow Chocolate bar was launched throughout New Zealand on February 8 2010, supported with a fully animated television commercial, outdoor and point of sale advertising. 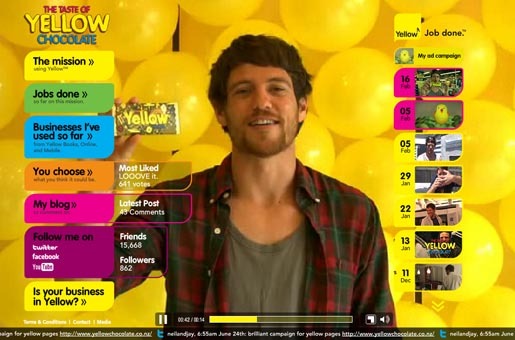 The yellow chocolate bar was sold through Countdown, Woolworths and Foodtown supermarkets and service stations, with the wrapper carrying the story of how Josh had created it using the Yellow pages. Josh proved Yellow can help an ordinary bloke get an extraordinary job done. His was the fastest selling chocolate bar in New Zealand in ten years. People were paying $2 for what was actually a piece of direct marketing. Supermarkets sold out and bars would be traded online for up to $320. 80,000 followers online, 16,000 Facebook fans, 800 Twitter followers. It was the most talked-about campaign in New Zealand with 61% recall and 27% of people talking about it in everyday conversations. Online usage grew by 9%. Yellow Pages marketing director was Kellie Nathan. The Yellow Chocolate campaign was developed at Colenso BBDO & Aim Proximity by executive creative director Nick Worthington, creative director/art director/copywriter/digital art director Steve Cochran, digital creative director/art director/copywriter/digital art director/digital designer Aaron Turk, account director Rachel Turner, group account director Andrew Holt, agency producer Paul Courtney, account executive Katya Urlwin, planner James Hurman, retoucher Kevin Hyde at Imagecraft, AIM Proximity account director Terri Williams, creative director/digital creative Dave King, digital creative Aaron Goldring, digital producer Amanda Theobald, and Data Smugglers digital developer Dave Colquhoun. PR was managed at Porter Novelli PR by executive director Louise Wright, senior account manager Sarah Geel and senior account executive Anna McIntosh. Filming was shot by director Chris Grahame via Good Life Films with producer Tanya Haitoua-Cathro, with editor Paul Maxwell, and Special Problems animation team Campbell Hooper and Joel Kefali. Sound was designed at Native Post and Kog Studio. Photography was by Stephen Langdon, Reload, with Colenso BBDO retoucher Kevin Hyde. The chocolate was manufactured by Donovans Chocolates. Product sampling throughout New Zealand was provided by Product Placement.